LR127, introduced by Omaha Sen. Bob Krist and adopted 28-11, creates a new Nebraska Justice System Special Oversight Committee. The committee will continue to study the issues addressed by previous investigative committees and review the role of state agencies and their involvement in the justice system. The Executive Board will appoint six members of the Legislature to serve on the committee, with the chairperson of the Judiciary Committee serving as chairperson. The committee will brief the Judiciary and Appropriations committees in December 2017 and 2018 and issue a final report of recommendations to the Legislature before disbanding Jan. 19, 2019. A special task force proposed to research the public health implications of alcohol sales on the unincorporated village of Whiteclay also was approved. LB407, introduced by Lincoln Sen. Patty Pansing Brooks, will examine the impact of alcohol sales in Whiteclay and its surrounding communities and make recommendations to the Legislature on how to solve the economic and social issues. Members of the task force will collect, examine and analyze data on fetal alcohol syndrome rates, access to treatment services and the risk of alcoholism for children raised in the area. The task force will include the chairperson of the Legislature’s State-Tribal Relations Committee and the chairpersons of the Health and Human Services, Appropriations and Judiciary committees or their designees. An additional member of the State-Tribal Relations Committee also will serve on the task force. The Legislature approved the task force 48-0. 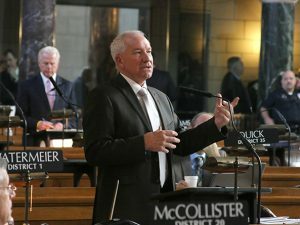 Lawmakers also advanced a bill that expands the reporting requirements of the inspector general of the Nebraska correctional system. Currently, the inspector general’s office investigates allegations of possible misconduct, malfeasance, statute violations, injury and deaths that occur in the state’s facilities. The findings are then published in the office’s annual report. LB539, also introduced by Krist, expands the reporting requirement to include all cases that result in death, serious injury, hospitalization or urgent medical treatment required by an employee acting in his or her official capacity. The inspector general may release investigative findings if it is determined to be in the public’s best interest. The bill also protects employees who provide information for such a report from negative employment consequences. The committee also advanced a bill that directs the state to donate 43 acres of excess land at the Norfolk Regional Center to Northeast Community College. Introduced by Norfolk Sen. Jim Scheer, LB376 requires the state Department of Administrative Services to seek authorization from the governor and the Legislature to donate the land, which will be used to develop a technology park. If the community college sells the property within 10 years after the donation, all proceeds will be remitted to the state’s General Fund. The bill passed on a 43-0 vote and takes effect immediately.